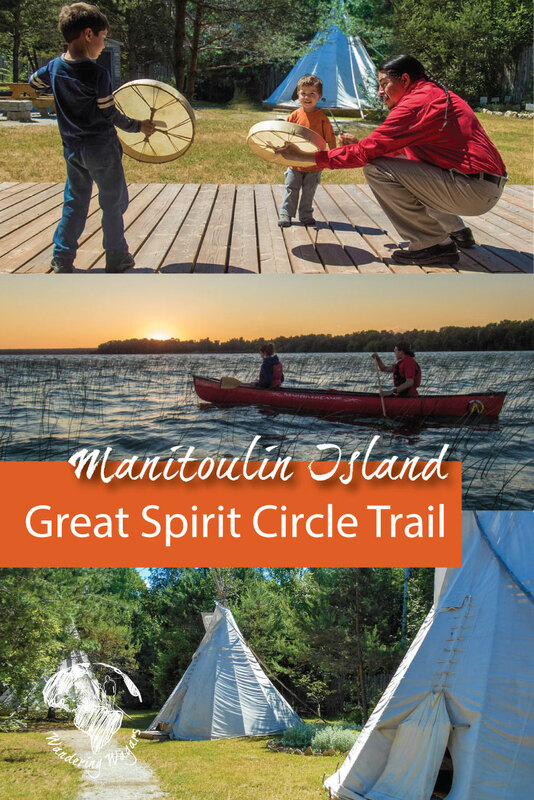 The Great Spirit Circle Trail of Manitoulin Island has been on our radar ever since Kevin and I first visited the island on a whim while on a weekend getaway trip to Tobermory. Manitoulin Island is the world’s largest freshwater island and has over a hundred inland lakes. Located in Northeastern Ontario, Canada, Manitoulin Island is home to several First Nation tribes. The Great Spirit Circle Trail offers nature and cultural based authentic Aboriginal experiences. It sounded like the perfect way for our whole family to learn more about Canada’s aboriginal cultures. Pro-Tip: There are two ways to reach Manitoulin Island from mainland Ontario. The first is via the MS Chi-Cheemaun ferry (Ojibwe for “big Canoe”). The ferry makes daily trips from Tobermory to South Baymouth from May to October. Ferry tickets for vehicles regularly sell out. So, be sure to book your spot as soon as you have your dates picked. The second route, which is open all year round, is via Highway 6 which leads to a swing bring connecting the island to the mainland. Accommodation choices for a visit to Manitoulin Island are plentiful. There are bed and breakfasts, motels, inns, and hotels. The island also has several campgrounds where you can pitch a tent or park an RV. It is even possible to stay in a teepee in one of the reserves! So, can you guess which one we chose? The teepee of course! 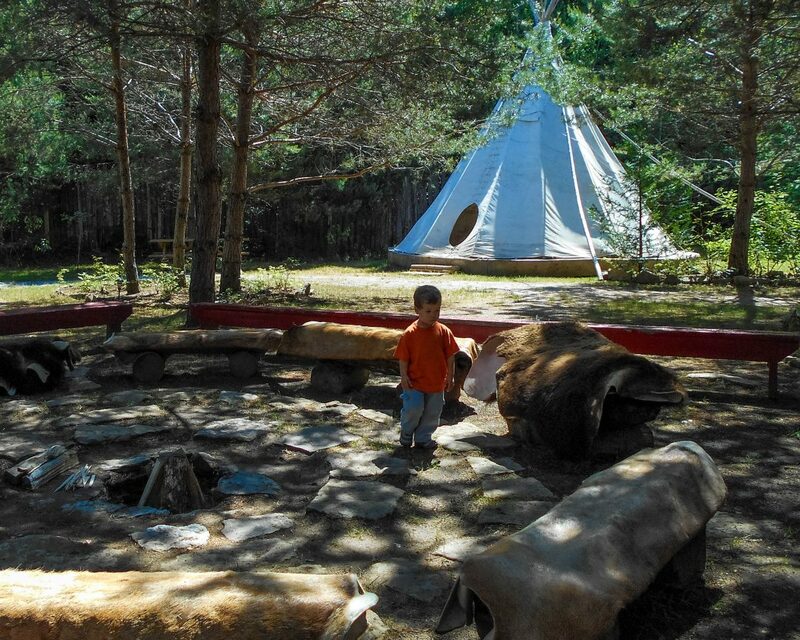 When we arrived at the Great Spirit Circle Trail glamping ground, the children excitedly looked around at our weekend accommodation. 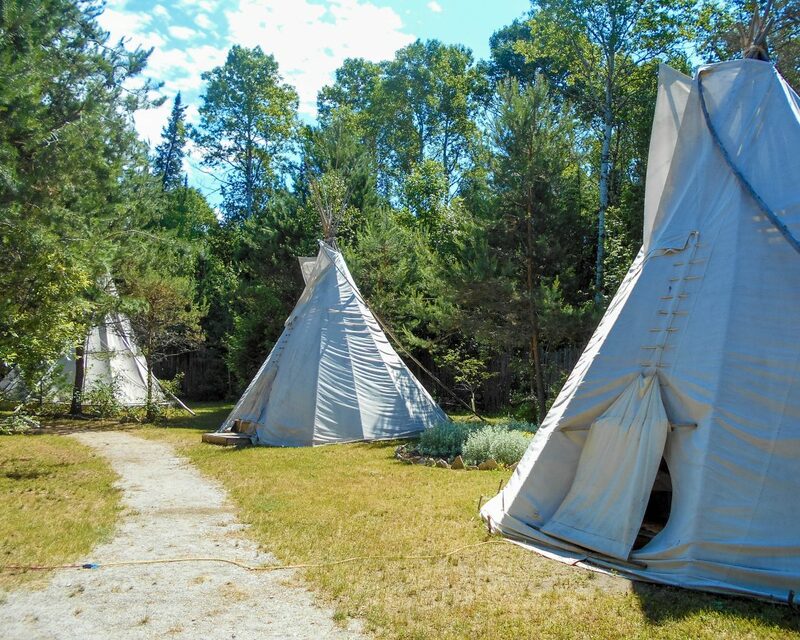 The teepee campsite is in M’Cheeging (pronounced “Chee-gin”) Reserve on Manitoulin Island. Specifically, it is on the property of the Great Spirit Circle Trail office. The site is 30 km from Little Current, Ontario. Or, if you are coming from the mainland via ferry like we were, it is an easy 40 km drive from the South Baymouth Ferry Terminal. At the site, we met our Great Spirit Circle Trail contact, the lovely Joanna Panamick. On arrival, she ensured all her records were accurate and that all the paperwork for our Great Spirit Circle Trail Experiences (the day tours) were finalized. Then, we proceeded to have a tour of the campsite. The Great Spirit Circle campsite has 4 teepees. All have access to power so we didn’t have any issues charging our devices. Up to four single beds can be accommodated in one teepee. Our configuration consisted of two single beds being joined together and the kids each had their own beds. There was also a basket in the teepee which had candles, bug spray, and a flashlight. A deer skin rug was laid out at the entrance and a much softer buffalo skin rug was in the middle of the room. There were two side tables that had candle burning lanterns. It was early in the season during our stay and we were the only guests! C and D had the run of the place. The Great Spirit Circle office closes down at night, so one of the staff of members, Miishiin (Michael), stayed overnight as well in case we needed any assistance. At the campground, there was also a large washroom with a separate shower (that has hot water). We also had access to a refrigerator for perishables. In the middle of the site is a firepit with benches. Wood is available for guests who want to avail of the campfire. Dotting the campsite are several gardens. We listened, intrigued to learn about the medicinal properties of the many plants. Joanna patiently answered all the questions the children had. The glamping accommodations were not as glamorous as we previously had in Wadi Rum, Jordan. However, the beds were incredibly comfortable and the unique experience exceeded our expectations. Pro-Tip: Poison Ivy is abundant on Manitoulin island. This plant secretes oils that can cause bad rashes, so be aware of your surroundings and don’t leave the trails or main campground areas. There were two main reasons for bringing our children to Manitoulin Island. The first was so that they could experience the raw beauty of this incredible island. The second, and equally important, was to be able to expose them to some of the First Nation cultures of Canada. The Great Spirit Circle is owned and run by local aboriginals and offers a glimpse into their culture with every excursion. Our first experience started late morning. 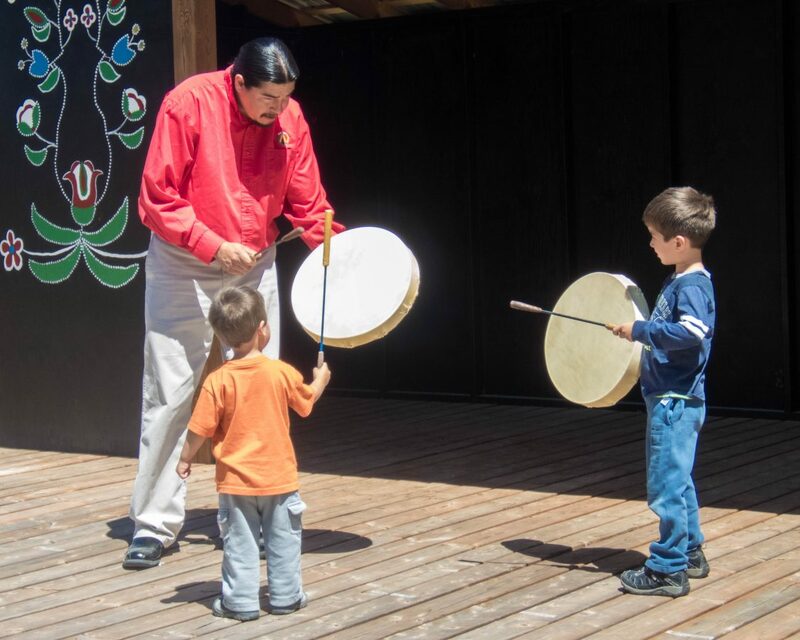 The Voice of the Drum Make and Take Experience began with a lesson on the importance of the plants and traditional medicine in Ojibwe culture. Our guide for this experience, the fantastic Craig Fox, walked us through the smudging ceremony, a ceremonial prayer involving spreading the smoke from burning cedar over your body as a way to purify yourself and get rid of negative energy. At this point, I quickly realized that this was not just a simple arts and crafts activity. Craig demonstrated how a long strand of deer hide was used to thread a circular hide onto a wooden frame. For the next hour, Craig talked about the importance of drums in native culture while he worked with Kevin and C to intricately secure the hide to the drum base. It was a fascinating glimpse into Canada’s indigenous heritage, and a good primer before our trip to 12 Things To Do in Yellowknife, Northwest Territories During WinterYellowknife Northwest Territories. Pro-Tip: Certain parts of the Great Circle Experience, such as the smudging ceremony, are not open for photographs as they are considered sacred. Your guide will let you know when it is not appropriate to take photos. With the drum complete, C was sad to learn that he couldn’t use his drum right away as it needed to dry for a few days. His mood was lifted as soon as he found out he could use one of the drums owned by the Great Spirit Circle Trail. In preparation, Craig talked to us about the importance of the drum in his culture. He narrated the story of how a young girl had a vision where elders instructed her to give the drum to the male leaders of two warring tribes. The encounter ended the feud and brought peace. C listened intently to the story. The amazing experience was capped off when C and D got to drum on the stage located at the camp site with Craig! Our next Great Spirit CircleTrail Experience started later in the afternoon. 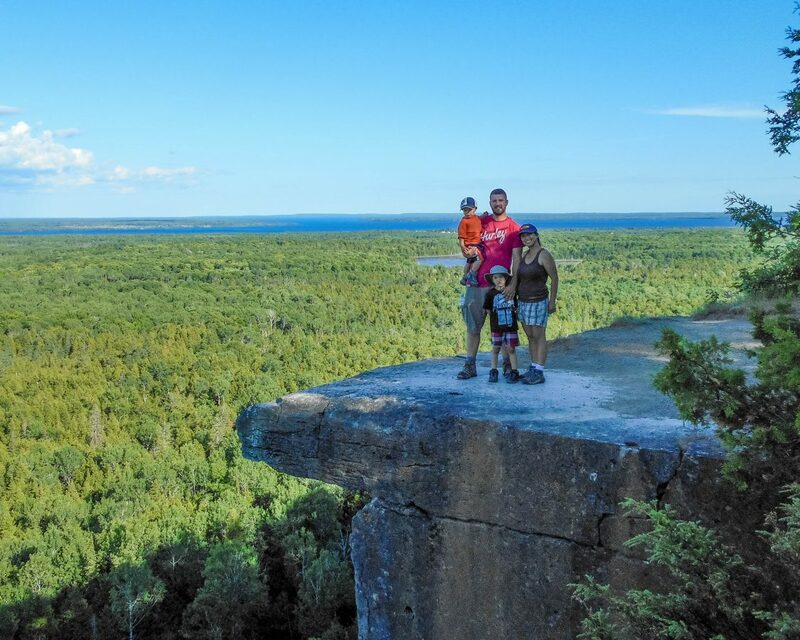 We hiked the Cup and Saucer trail which is one of the most popular hiking trails in Ontario. We had the pleasure of having Craig again as our guide. Before beginning our hike, Craig provided us with some crushed tobacco leaves which we scattered on a tree of our choosing near the entrance of the trail. He told us this was our way of letting Mother Nature know that we would be entering the trail with good hearts and to help keep us safe on our journey. Pro-Tip: The Cup and Saucer Trail involves some steep climbs over large rocks. Make sure you have good footwear. Small children may need to be carried or lifted over some sections. The cliffs at the top are also sheer drops of hundreds of feet. Make sure you keep a close eye on little ones and ensure they stay well back from the edges. There are 14 km of trails on the Cup and Saucer hike of which 2 km are part of the adventure trail. Craig led us on a family-friendly version of the hike which bypassed part of the main trail and the adventure trail. The views from the lookouts were absolutely breathtaking. We wish we could have stayed longer but we needed to get back into town to eat some dinner before our last adventure for the day. For this Great Spirit Circle Trail Experience, we met our new guide, Falcon Migwans, back at the campsite. Falcon would lead us to the shores of Lake Manitou where our canoe was already waiting for us. Although Kevin and I had canoed together numerous times previously this would be our first time canoeing with both C and D with us. The boys were definitely troopers! Both even “helped” and D only lost his paddle once. We periodically took breaks so Falcon could tell us about the area and share stories about local legends. Watching the sun set behind the mountains from Lake Manitou was a memorable ending to our day. Pro-Tip: Try not to schedule too many activities in one day. Originally, we had planned to do the Heritage Canoe Tour the day before. However, due to the weather, it was postponed to the next day. 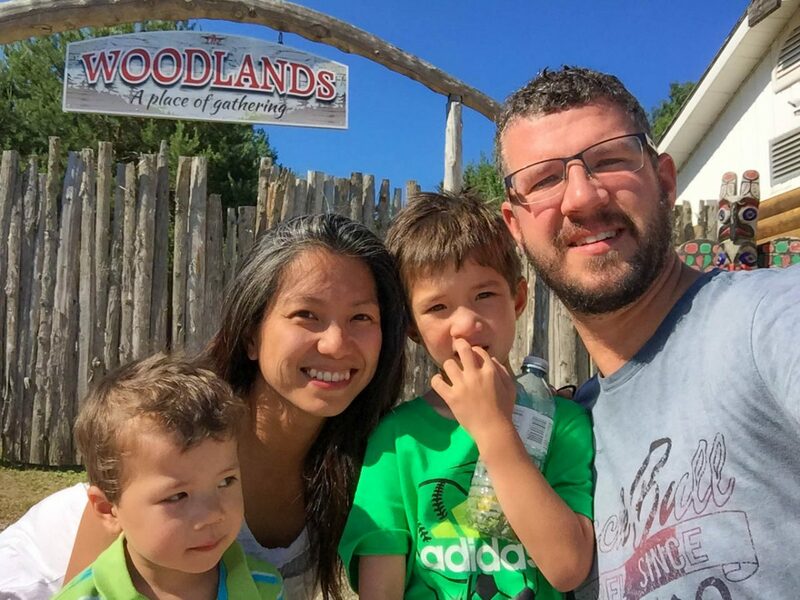 Our adventure packed day was our ideal way of exploring Manitoulin Island. However, we were also glad to have learned more about the First Nations people of Canada. Little did we know that the best was yet to come. 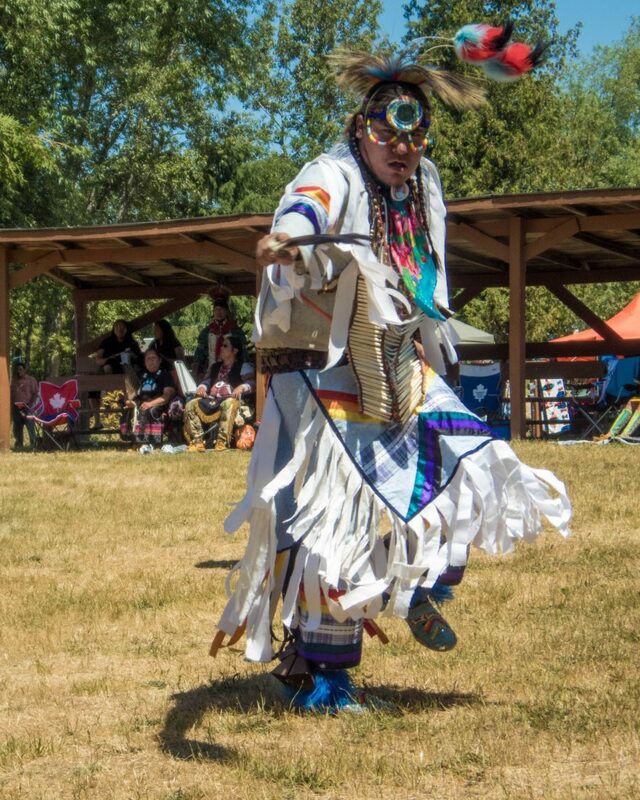 Our guide, Craig Fox, invited us to attend the Shenguindah First Nation Traditional Pow Wow (A Pow Wow is a social gathering where various First Nations communities get together for visiting, singing and dancing). It was amazing to watch and we can’t wait to share that experience with you. We believe in traveling with our children to learn more about a country and its people. The Great Circle Trail allowed us to learn a lot and we did this without even having to step on a plane. That looks really fun! We would love sleeping in a teepee! Cool! This is a new destination to me. What a fun and educational experience! I’m sure my girls would love to sleep in a teepee! What an awesome experience! And that campgrounds looks great! What a great place! Looks like you all learnt so much about the culture and history too. Looks like a great destination for kids or anyone wanting to learn more about the First Nations of Canada! I appreciate the variety of accommodations and things to do but would especially love the sunset canoeing. The scenery looks beautiful. Thanks for sharing your experiences there! This reminds me that we have Cheif Seattle Days here in my tiny town this month! Even though my tribe never represents at the pow wow, it’s so much fun and it’s the only dash of family history my kids get. That’s a great thing to be able to share with your kids Rob. Ours absolutely loved the Pow Wow are anxious to visit another. What a great learning and adventuring experience. Very cool. From beginning to end this looks like an amazing experience! I would love to have our family stay in a teepee some day! Looks like it was great fun for the kids as well! This looks like such a fun experience and a great way to learn about Aboriginal culture. How did the drum turn out after it had dried? Staying in a teepee seems to be the obvious choice! It is also nice to support a place that is run by the local indigenous group. And getting such an intimate glimpse of the culture is a great educational experience for the kids too! What an incredible and unique experience. I love the teepee style glamping. Seriously, the kids would flip for that!! We stayed in a traditional toukal in Ethiopia and they loved it. This was such a unique trip! I can’t believe you got to stay in a teepee! Cute family activity. I bet the kids loved camping in the teepees and all the colorful drums. I really liked you article. The trip looks rich in activities and discoveries, must have been a delight! Must have been a wonderful experience. Really an ideal family adventure too. I have never thought of Canada as my top destination until reading this post. I find it very interesting and would love to visit Manitoulin. Thanks for highlighting this one and for sharing these lovely photos. I have not been to Manitoulin Island, but Inhave explored plenty of Ontario and it has marvellous treasures to explore. Thx for sharing this destination with us. What a cool experience! I’ve always wondered what’s it like to stay in a teepee. Didn’t know it’s big inside! And that is definitely a cool hike. The views are amazing. Seriously, you guys have the best adventures. Can I be adopted? Hehehe. What a unique place to visit! To be honest, I’ve never heard of the island, but it looks like the perfect place for an adventure. This is a great way to travel where by you are imbibing the culture of the place and get a holistic understanding of the places you visit. An enriching experience for the kids too. This is a perfect adventure for kids in summer! Not only it is fun, but it is also a great value to their education. It seems like a great place for the whole family and it has many offerings to do and explore. I would definitely choose to stay in a teepee as well for a change and feel the real camping experience. What an incredible experience you had on your family trip! 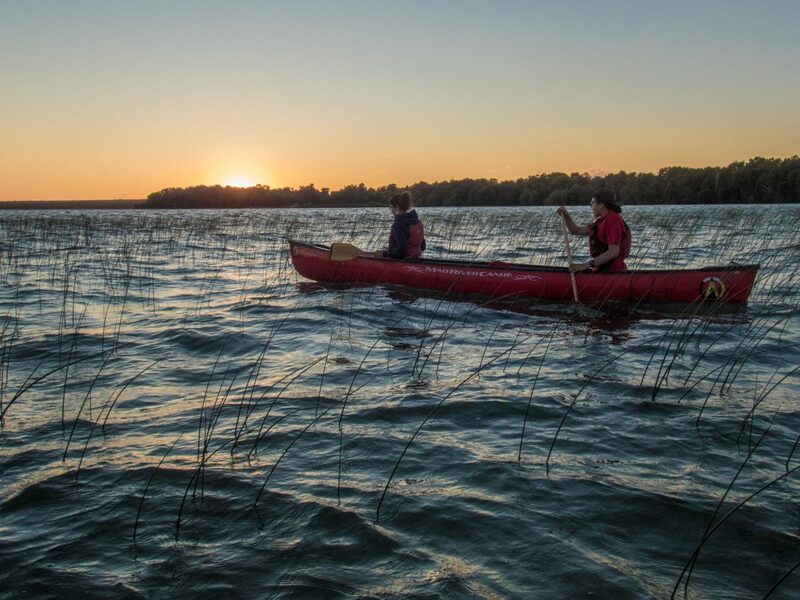 I’d love to do Sunset Canoe Heritage Tour that looks just amazing! I love the glamping and excursions! I hope to come back and explore more of Canada soon. There are so many great hidden gems like this one. Thanks for sharing. I wanna try glamping hahaha… Looks like the kids had so much fun with so many activities to do. Your family is awesome, you go to so many places, just wow! What an awesome experience for your kids! Staying in a teepee must have been great! Glamping is such a great concept isn’t it! It looks like a great experience especially with kids. Nice pictures. Thanks for sharing. Camping is soo cool, not only for kids! It is one way to be reunite with nature, and also to learn rural life with less complications. Such wonderful doable activities with kids. The locations are too good, connects well with nature. GLAMPING! I love this. What fun memories you’re making with your littles! What an awesome experience for your kids! My husband and I don’t have children yet, but this is SO inspiring for when we do! Looks like the adventures never have to end 🙂 PS those teepees look awesome!! Amazing! My kids would really enjoy the teepees, the Native Americans dances and traditions. Looks like you had an awesome time. very nice place for holiday. campsites are also very unique. would be fun if we were camping with the family. I love this place. The place looks very nice. Who would have thought about sleeping on a teepee? But I must say, the teepee is done in style and so comfortable looking, not the hardship I’m envisioning. Learning about cultures and people tribes is the best thing about travel. And you deserve a huge thumbs up for sharing such experiences with your children! It sounds and looks amazing! I am so glad you guys had a nice trip. Your children are lucky to have great parents that take them on these types of adventures. I always thought camping can be challenging with kids. Looks like you were able to manage well. Any insight on how you managed it? What a great adventure! We stayed in a teepee once and loved it, no beds in ours- that is a nice touch! This is just the kind of place that i would look forward to going to enjoy a peaceful weekend with my family. Im sure children would love the atmosphere of camping. That sounds like a wonderful experience for you and your boys. How cool that you got to see a Pow Wow! I would love to try it myself. I was interested in learning about First Nations tribes at the Anthropology Museum in Vancouver, but this is more hands-on! What an amazing place. I love the paddle boats bit. Seems like you had a wonderful time. This certainly looks like a great place to learn and have adventures with your children! The sunset canoes look likg an amazing amount of fun – not to mention picturesque and certainly a work out for the arms!